Knit-a-square South Africa (KAS) operates from Gauteng in South Africa. 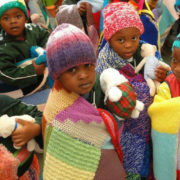 The organisation has been run by Ronda Lowrie, co-founder of Knit-a-square since 2008 and works to warm and comfort orphaned or vulnerable children. A typical Tuesday opening day for KAS SA (Knit-a-square South Africa) starts at around 9 am when Ronda arrives at the KasBarn. 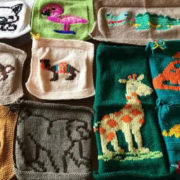 We have created the Knit-a-square wish list, because over the years as we have grown organically, kindhearted members have sent a variety of goodies. Created in 2009, the monthly square themes have been bringing members together ever since.